Giveaway Monday: VENeffects Skin Care $185 value!!! Although I normally blog about clothing and food, having great skin care is very important to me. I was blessed with good genes, but I also do a lot of maintenance. I get regular facials and always apply sunscreen. I have to wear a lot of makeup for work, so I love the fact that VENeffects is helping me put my best face forward. No matter your weight or size, putting your best face forward is the most important thing you can do. I had the pleasure of meeting Rebecca Booth, M.D. and Cecil Booth founders of VENeffect at a skin care luncheon for Neiman Marcus. The first thing you notice about these ladies are their flawless, dewy skin. Although their ages where never discussed, they don’t look a day older than thirty-five years old. Dr. Booth is the author of the Venus Week: Discover the Powerful Secret of Your Cycle…At Any Age and is recognized as a leader in women’s health and hormonal wellness. The ladies have made appearances on The Today Show, and are regularly quoted in magazines including O, The Oprah Magazine, Redbook, Shape, Seventeen, and Natural Health. I was intrigued due to their long impressive resume, and the fact that they are sisters. I have three sisters, and I am not sure If I could ever start a business with any of them. VENeffect line is it offers breakthrough anti-aging skin care products that source their potency from a proprietary blend of phytoestrogens -”100% plant-based technology that safely and effectively preserves and restores the youthful glow of healthy, vibrant skin”. I love the fact that this line is 100% plant-based. It feels so good to do something good for the environment. VENeffect is designed to work the way our skin naturally works building collagen and elasticity. Mother Nature sets up the effects of estrogen on skin through tiny “locks” known as estrogen receptors. There are millions of these located throughout the skin on the body, but the skin on the face is highly packed with these receptors. Most skin care lines target sun damage, environmental damage or simple chronological aging. VENeffect is different in that it is dedicated to reversing hormonal aging with a unique and powerful formula based on phytoestrogens. I have been using this product for 3 months and I love the results. Although my skin didn’t have much damage I do notice an immediately glow and firmness when I apply the product. I wish they would come out with a face wash!!! 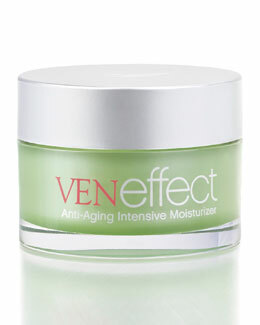 We have one bottle of VENeffect Anti-aging Intensive Moisturizer cream sold exclusive at Neiman Marcus for $185 plus tax. Click the Neiman Marcus link and you can see a great video of how the product works. Write a comment on this post about what skin care you currently use? One winner will be chosen at random and contacted through email. Previous Post Week Of Giveaways!!!! I currently use Perricone MD. I’m been so curious about your skincare line ever since I saw you on a talk show! 🙂 “naturally works building collagen and elasticity”!? Oh I really want this! I use Juice Beauty 🙂 Would love to try VENeffects! I use Lancome and Clinique. I don’t really have a skincare line in place that I use, I probably experiement too much. Lately I’ve used Dermalogica and Peter Thomas Roth. I alternate between Dr. Dennis Gross and Evan Healy. I’ve been using Intaglio for years, time for a change I would love to try VENeffects. I use Dr. Hauschka. Would love to win this! I use Exuviance and SkinCeuticals. I mainly have used Olay. Hello I use Bliss and Aveeno – Thanks for the opportunity of winning such luxurious skincare. I hope I made it in time, it’s still Friday for me. I been using most of the Caudalie line. Thank you for this great giveaway! If you scroll to the bottom of the Bites Of Style Main Page You will see a Follow BOS button. This will allow you to sign up to receive emails of our new posts. You can also follow us on Facebook & Twitter @BitesOfStyle where we often post last minute contest and sales news.